Today's recipe is so simple that even a 5 year old can make it with little help from parents. Its as simple as that. I very well remember those days when we used to have Curfew and people were not supposed to go out of house. Schools were closed, grocery shops and other necessary stores were also closed. People were in need of vegetables and other important things. That is the time when my mom used this spicy mixture and made a side dish for roti or rice. Don't remember the exact year when this happened but I guess I was around 5 or 6 yrs old when this happened. The curry tasted so delicious that even after when we grew up, me and my sisters used to please mom to make this curry for our lunch boxes. Today's recipe is the one which I learned from my MIL. It's a tangy and sweet simi gravy curry which is made with boiled eggs, taro root, tamarind pulp and jaggery. Simple and delicious curry which is made with in 30 minutes. This recipe goes to the 2nd day of BM 60 under the theme "Family recipes." Boil egg and remove shells. Mark 2 or 3 slits on eggs so that they wont popup when u cook. Peal the skin of chamadumpalu / Arbi and cut into small pieces. When they crackle add onions, slit green chilies and curry leaves. Saute for 2 minutes and add haldi and arbi pieces. Stir for few minutes and add Boiled eggs. Dosakaya which is called as Yellow cucumber / Lemon Cucumber in English is an Indian Vegetable mostly used in south Indian Cuisine. You can eat this cucumber raw or cook along with lentils / Shrimp or just simple curry with onion and tomato. Today we are starting with 4th week of BM 60 and my theme for this week is "Family Recipes". For day 1, am here with a recipe which my mom used to make it often when I was a kid. The curry is made with dosakaya which is also called as budankaya in Andhra. The name budankaya looks funny but that is how it is called in some parts of Andhra Pradesh. Its a simple curry made with onion and tomato along with cucumber. This is my dad's and also my husbands Favorite vegetable. Hubby dear also likes this curry when I add some fresh and raw shrimp to it. Click herefor the Dosakaya and Shrimp recipe. Avocado is an incredibly healthy food and loaded with important nutrients. They are high in healthy fats like monounsaturated fats and good source of fiber, vitamins and minerals. These fats are specially important for people suffering with diabetics. Cucumber is a widely cultivated plant in the gourd family.Cucumbers are grown to eat fresh. 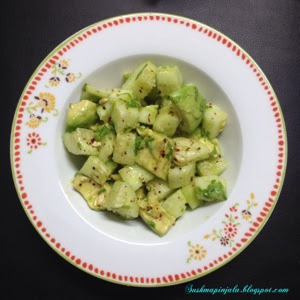 Cucumbers help to keep skin healthy also helps in curing constipation and kidney problems. They also deal well with diabetics and also keep blood presser in control. Read in a newspaper recently that cucumbers can treat Cancers and Diabetics. Bitter Melon also known Bitter Gourd is a unique vegetable mostly used in Indian cooking. They contain at least 3 active substances with anti-diabetic properties. Several compounds in Bitter gourd have glucose lowering properties. These are also used for various stomach and intestinal disorders like ulcers, constipation and intestinal worms. Fresh Bitter gourd is a excellent source of Vitamin-C.Their bitterness can be reduced by parboiling or soaking in salt water or just by adding little salt to the cut pieces of the gourd. By now you must have understood that today recipe is about Bitter Gourd / Bitter Melon. Yes, for day 2, week 2 of BM 60 am here with a Recipe with Bitter gourd under the theme "Diabetic Diet / Healthy Diet". Scrape off the skin and wash the bitter gourd with water thoroughly. Happy New Year 2016 to all my viewers, fellow bloggers and friends. This is the first post for this year 2016 and I want to start the year with a tasty and healthy dish. Today we are starting with 60th Edition of Blogging Marathon, my theme for this week is Diabetic diet / Healthy diet.